"Carving Unlimited" offers bone, jade, stone, ebony, sculpture, gemstone and Maori carving in a unique craft Gallery with bone carving classes in the Studio. Whalebone and artefacts on display, too! Ian displays a diverse range of work and each piece tells its own unique story. 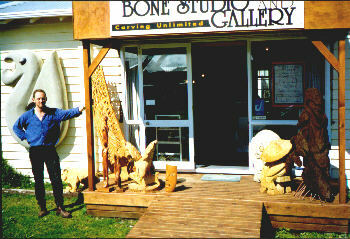 The Bone Studio is divided into two main parts, the gallery and the Studio workshop. In the gallery, artists such as New Zealand wood skills winner Gary Wilson, Colin Bennett, Peter Crump, Tony Coombes and award winning "chainsaw carver" Brian Trow exhibit carving in a wide range of materials, all with a quality finish. 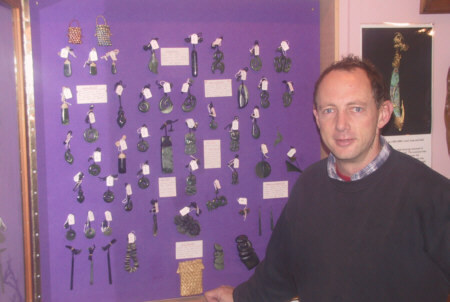 Ian's own varied range of pendant and figurine work is also displayed. Ian intends this to be the most comprehensive display of carvings in New Zealand. In the workshop, watch crafts people carve to the highest standards or take a class -- make your own high-quality bone carving for a lasting memento of Whitianga and New Zealand. At "The Bone Studio," Ian Thorne can teach you how to hand carve your own high quality bone carving and give you a Kiwi experience that you will never forget! Yuriko and Masa with their week's worth of exquisite carvings. "Anyone can do it -- and well!" says Ian, a master at this ancient craft. With over 1000 students since 1990 -- from New Zealand, Australia, Japan, Korea, Germany, Switzerland, France and Czechoslovakia -- Ian has also proven to be a master instructor. Ian guides each pupil through a series of steps, using basic hand tools, to produce a beautiful carving that surprises and delights everyone. Ian says "People are always shocked to find they can make better carvings than they can find in the souvenir shops. They take home a Toanga (treasure) they can be proud to give to someone special -- and they learn a skill and gain self-esteem all whilst having fun!" "You get very relaxed and focused on what you are doing with this great feeling of satisfaction at the end of a day. Watching their faces light up when their carving is handed back polished up is always a great buzz!" Classes are morning and afternoon so you can carve all day or choose two separate sessions for your convenience. Bring your own lunch and you can sit on the deck, the lawn or even walk two minutes to the beach for a break. The Bone Studio is located in the middle of town, close to the Information Centre, so it's easy to call in and see what we have to offer. "Don't miss this opportunity to go back in time and experience a craft common to all our ancestors and leave with a lasting memory of Whitianga and New Zealand." Web site: Stop by our web site at http://www.carving.co.nz. and extensive coverage of our Gallery.